Climate change should be on the entire Sussex communities mind, in one way or another. Becoming more aware of the effects of emissions on the environment, we are looking for “greener” ways to live, from buying local (and sustainable) food and products, traveling via lower-emission transportation methods, and building up recycling and composting programs. 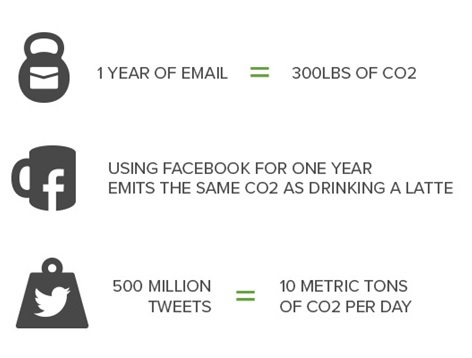 Have you thought about your carbon footprint in relation to IT, emails and social media though? There are some obvious things that residents of Sussex can do to help — like riding a bike to work or turning off the lights when you leave a room — but everyone tells you that stuff. As a community that often uses technology on a daily basis, we wanted to focus on some of the ways that everyday technology consumption like email, social media, and data storage affects your carbon footprint. 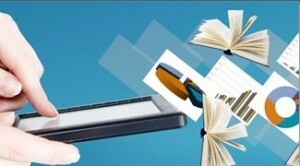 Going paperless is great, but electronic communications are not exactly carbon free. According to Mike Berners-Lee — professional carbon-emissions consultant and brother of the guy who invented the World Wide Web, so he definitely knows what he’s talking about — every time you send an email into the ether(net), you’re using up 4 grams of carbon. And that’s if you don’t add any attachments. Okay, 4 grams does not sound like much, and in the grand scheme of things, it really isn’t. Four grams is about how much sugar Mary Poppins advises will help the medicine go down. But think about how many emails you send each day, then multiply that by 365. That’s a lot of sugar. Now, this is not to say that email is a bad thing: it’s certainly better than sending all of those messages on paper in paper envelopes using sticky paper stamps. But there are a lot of ways to cut down on carbon by checking the number of emails that go whizzing from server to server. Check your overhead. All computers have an energy overhead, and in our experience most on-premises servers tend to be underutilized. Some of the most efficient network hardware costs an extreme amount of money and also requires large amounts of use to make them cost effective. Rarely can the average business justify such purchases, not just in money, but also in utilization. Using a manager hosting service (read more here) that optimizes its networked hardware for maximum efficiency can help you save carbon while reducing your monthly energy bills. Don’t spam. Nobody likes to think they’re a spammer, but it happens. Even reputable companies with great products tend to carpet-bomb people’s inboxes with marketing messages that go mostly unread, in the hopes of finding just one more loyal customer. Just because you can send an email to anyone and everyone it does not mean you should. Tailoring your audience help you increase conversion rates while cutting back on carbon. Start a conversation. We have all done it; emailed that person who is sitting close enough that you could literally talk to them without even raising your voice. Instead of sending that email, have a little chat. Even if they’re down the hall, get up and go talk to them. Guaranteed, you’ll use less carbon by talking than you would by sending that email. Speaking of conversations, maybe emails are not your thing. Keeping messages short and sweet — say to the tune of 140 characters, a quick pic or a sentence-long status update — can’t really take up much carbon, right? Delete unused accounts. Maybe Instagram just is not your thing. Maybe you don’t really understand the appeal of tweeting. Or maybe you signed up on Google Plus to get more exposure for your business, book club, or group. Whatever the case, if you’re not using a particular social media site, deleting your account can decrease your carbon footprint while also helping you declutter your online presence and protect your privacy. Just Delete Me has direct links to the delete pages for hundreds of social media sites, with a visual guide of how easy it is to send your account into cyber-oblivion. Contributed by David Dunlap from Single Hop. This entry was posted in Green stats, facts & news, Green Suppliers and tagged Green Tech. Bookmark the permalink.